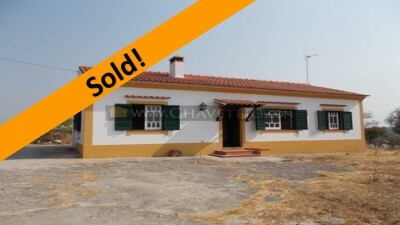 This lovely property is perfect for anyone looking to live the good life here in Portugal by self sufficient by living off of the land and maybe having your own live stock and still having lots of space left over. Or if you are an equestrian enthusiast, then why not give your drove of horses the freedom of roaming around the wonderful plot of land! The property itself has, at the moment, one bedroom but there is space for two. It has a very nice, double aspect, country style wooden kitchen, a good size bedroom with a lovely wooden floor and a spacious living room with an open fire place. The family bathroom is also a good size and if fully tiled and has a bath tub with a shower over the top. The property is ready to move into and doesn’t need any work doing to it. The land has a borehole, perfect for watering the land and it very close to the large towns of Tomar, Entroncamento and Torres Novas. Torres Novas is 13kms away, here there is a cinema, a shopping centre, various shops, cafes and restaurants. Entroncamento has various cafes and restaurants and a large train station from where you can catch a train to pretty much anywhere in the country. The historic town of Tomar, which is around 11km away, is home to the UNESCO listed Convento de Cristo. Tomar is a popular and bustling town with a variety of restaurants, cafes, bars, historic monuments, schools, university, bus and train station and hospital. The closest airport to the property is located at Lisbon, which is around one and a quarter hours’ by car. Lisbon airport is serviced by a variety of low cost airlines, which operate regular flights into and out of the United Kingdom and other European countries as well as some direct transatlantic flights to North America.